1974. Amityville, Long Island. The DeFeo family lives in a house called “High Hopes,” although their situation is looking pretty hopeless. Twenty-somethings “Butch” (John Robinson, “Transformers”) and Dawn (Chelsea Ricketts, “More Than Enough”) live under the shadow of an abusive patriarch, Ronnie (Paul Ben-Victor, “Get Hard”), who’s apparently embroiled with some Mafia types. As the home situation worsens so does Butch’s mental state. He’s hearing voices and seeing strange shadowy figures. It’s not helped by the fact that he and Dawn indulge in mini séances in their secret “Red Room.” Death is coming, but by whose hand? Well, if you know the story of 112 Ocean Avenue then you already have the answer to that question. And how could you not, given that this, The Amityville Murders, is one of at least 15 feature films since the 1970s on the matter already in existence. However, with this take being a lower budget entry in the perennially swelling Amityville canon, we can excuse some shoddy post-dubbing and foley effects. Less excusable is that the exterior shots of the famous house itself appear to be crafted in CG, with a dodgy ‘90s rock video storm-sky green-screened behind it. When making a film about a haunted house sending its inhabitants into a murderous rage, borrowing from “The Shining” makes sense. The score frequently alludes to Penderecki’s Dream of Jacob, and composer Dana Kaproff brings appropriately shivery strings to an “all work and no play” creepy notebook moment. At one point Butch lies awake, psychically listening to the fraught voices of his family; and on numerous occasions he stares into the lens, insanity burning in his Nicholson-esque eyes. But writer-director Daniel Farrands’ control of the material doesn’t come close to matching Stanley Kubrick’s. 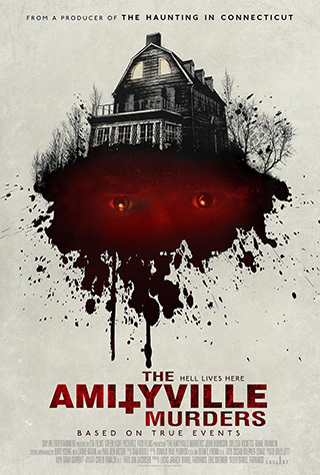 The Amityville Murders starts by setting up a dysfunctional family, and it would at once appear that we are getting a new twist on the much-trampled tale: A malevolent father; a mother (Diane Franklin, “The Final Interview”) turning a blind eye; and twin adult offspring, bonded by fear, looking for a way out of the madness. It’s ripe for a true crime re-telling which proposes family dynamics — and ensuing mental illness — may be the homicidal trigger. But only too swiftly Farrands throws in a supernatural element which leaves us in no doubt that there are metaphysical forces behind the imminent bloodbath. There’s no room for ambiguity here — no sense that Butch is compelled by mere madness — because both he and Dawn bear witness to the supernatural. This includes a bizarre scene where a bowl of loose change turns into a tornado of deadly bus money. In fairness, it is an effective performance from Robinson, both spaced-out and intense in equal measure, but he seems to be acting in a different movie from his colleagues. Part of the problem is the dialogue. No actor can bark “Shut your trap!” at someone outside of “The Railway Children” and hope for serious impact. Farrands seems to have competing interests. It’s not only the imbalance between the psychological and supernatural elements — there’s also a severe unevenness of tone, and not just between comic absurdity and graphic horror. In the end we are expected to appreciate the human tragedy of the incident in a soppy epilogue. Had it been a crime of desperation, sure. But as there’s an undeniable ghostly force at work then the event is humanly unavoidable, therefore it is shorn of its tragedy. It’s a movie defined by awkward contrasts: High-quality production design bumping up against unconvincing green-screen; brooding orchestral murmurings invaded by ugly synth shrieks; po-faced family drama competing with laughable schlock. And that’s before we touch upon the contradictions in the characters, who sometimes perform personality u-turns in the space of a single scene. Gasp in bewilderment as Dawn, replete with rationality, calmly insists that she and Butch should take the stolen money and escape this dreadful home — only for her to start summoning demons seconds later, rather than packing her bags. Then there’s the father, harbinger of all the hate. Here we have a man who, upon finding his precious money stolen, immediately blames his son and erupts with a volcanic rage. Culprit identified, you’d think. A couple of scenes later, though, he’s back at the empty safe, weeping like a child who’s lost his favorite toy. This sort of inconsistency is an impassable block to empathy. While all of this craziness is happening around them, the other members of the family — two more brothers (Zane Austin and Kue Lawrence) and another sister (Noa Brenner) — are oddly oblivious. They can no better hear big brother Butch screaming in anguish as he’s stalked by a figure made of smoke and shadow than they can the crack of rifle-fire in the next bedroom. That mysteriously unheard gunfire is one of a handful of Wikipedia research details that Farrands inserts. Another is the fact that all the bodies were found lying face down in their beds. The Amityville Murders doesn’t offer any sort of theory as to why this might have been (were the victims arranged? ), but instead lazily proposes that the family’s tendency to sleep on their fronts is, in the mind of the killer, some kind of invitation to a murderous destiny. It all adds up to psychological horror which is weak on both the psychology and the horror. Rather than offering a new, hitherto unseen angle from which to view this horrible, unshakable incident, it turns out to be just another Amityville movie. Maybe Farrands will bring fresh eyes to his upcoming films about Sharon Tate (“The Haunting of Sharon Tate”) and Nicole Brown Simpson (“The Murder of Nicole Brown Simpson”), but I somehow doubt it.